African Mangoes --- A Weight Watcher's Boon? 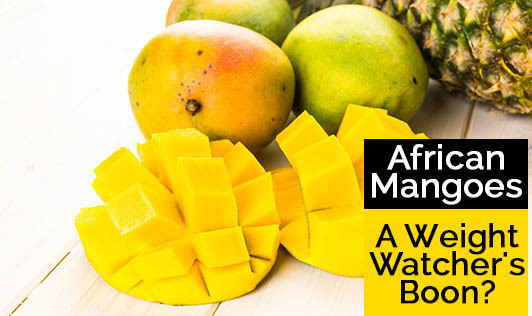 African Mango is a new product on the weight loss market. It gained popularity after it was mentioned by Dr.Oz on the Oprah Winfrey Show. It is comprised of an extract of a plant known as Irvingia Gabonensis. Irvingia, an extract of the West African mango, has been used for a variety of medicinal purposes in Africa for many centuries. Recently, there have been a few studies on the use of this extract for weight loss. As a country with mounting weight issues, we are chronically on the search for that magic pill which allows us to eat whatever we want while managing weight at the same time. African mango is a high fibre food, and high fibre foods had long been known to support a healthy and balanced diet. This can help stimulate fat hormones and curb appetite cravings. Additionally, green tea is included to boost metabolism and increase energy to burn even more fat. In the two randomized trials in overweight and obese humans using Irvingia, participants in the Irvingia group lost on average 2-5 kgs/month compared to the placebo group. Neither group made any lifestyle changes during the trial. They also noted that cholesterol levels and blood sugar levels improved significantly compared to the control group. That being said, it may be helpful for those needing to lose 2-5 kgs, and studies have shown no undesirable side effects except for headaches, flatulence and difficulty in sleeping in some cases. It's certainly worth steering clear of supplements if pregnant or breast-feeding. More independent studies need to be done by independent researchers (the two studies mentioned were performed by researchers with a vested interest in the company making the product). •Weight loss trials have been successful in 70% of cases. •No known or serious side-effects. •Lot of written material and choice of products available. •No trial of African Mango is offered by the supplement manufacturers. •African Mango does not contain any patented ingredients. •The makers of African Mango suggest that you will lose weight without diet or exercise, which may not be realistic. •Other ingredients besides the actual mango extract are not disclosed. •Long-term effects of African Mango use may not be known, since it is relatively new to the market.Information regarding safety and efficacy in pregnancy and lactation is lacking. Watch this space for more information in the future! We are right on it and will keep you posted.